The latest Read All About It podcast ‘victim’ is Gregor Kyle, a friend and former Celtic colleague of mine. Gregor now works with the Daily Record, mainly on their website, though he has been known to pop up in the newspaper, most recently when the world’s largest passenger plane, an Airbus A380, briefly touched down in Glasgow and he managed to sneak on board! Gregor Kyle brings a few of his favourite books to the podcast. 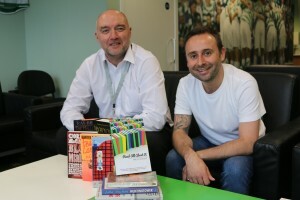 It was an enjoyable chat with Gregor, made all the more impressive by the fact that he turned up for the interview armed with all the books he’d chosen for the various categories.